The strong American death metal tradition reflected on HOD’s music, as we do perceive the echo of Morbid Angel, Deicide, Death and Cannibal Corpse. At the same time HOD obtain style from the European black/grind of Marduk, Impaled Nazarene and Belphegor. In some of the songs there is a sensitive slowing down of the tempo with which the band reminds me strongly of the last album of Nile. 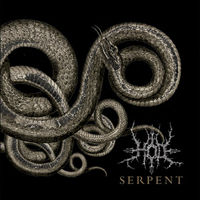 In the whole raging mixture of “Serpent” is set on a claim for originality, but as if in a magic mirror too much memories have been reflected in this album. The final hatches are Vladibeer’s vocals, which drop the anchor on the dark waters of black/death style. HOD are indeed an extreme band with a little bit archaic grind taste. All the fans who are disappointed from the contemporary European death metal scene would like their music. The black metal fans also would not be reprieved! However we expect more as an album’s time duration from Texas!